Shrimp Scampi, in garlic lemon butter. Photo courtesy Epicurean butter. 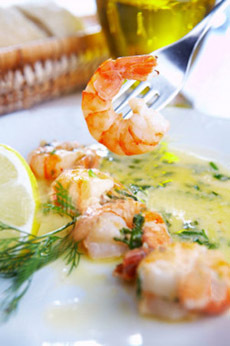 Today is National Shrimp Scampi Day. In our youth, it was one of the most popular recipes at Italian restaurants, often served atop a plate of linguine. The recipe can be quite simple: shrimp sautéed in garlic lemon butter. This recipe is a bit more elaborate, adding a topping of Parmesan and bread crumbs. Feel free to use the simpler version, and eliminate the cheese, bread crumbs and the broiler. Prep time, including the broiled topping, is 20 minutes. Serve with a light-bodied white wine, such as Pinot Grigio or Sauvignon Blanc. *If you prefer the dish without the broiled topping, omit these ingredients. †Instead of pasta, you can serve the dish with rice or other grain, or with a side of mixed vegetables. 2. SAUTÉ the garlic in the butter and oil in a 10-inch ovenproof skillet, until fragrant. Add the shrimp, lemon juice, pepper and oregano; cook and stir until shrimp turn pink. Sprinkle with cheese, bread crumbs and parsley. 3. MOVE the skillet to the broiler, 6 inches from the heat. Broil for 2-3 minutes or until the topping is golden brown. 4. SERVE atop the pasta. WHY IS IT CALLED SHRIMP SCAMPI? If you know Italian, you know that the word for shrimp is scampi. So why is the dish called, essentially, Shrimp Shrimp? According to Lidia Bastianich’s Lidia’s Italian-American Kitchen,” in Italy scampi are actually langoustines, small, lobster-like crustaceans with pale pink shells. In Italy, they are popularly sautéed with olive oil, garlic, onion and white wine. Shrimp Scampi. Photo courtesy Babble.com. 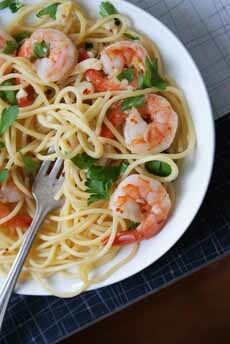 Italian-American cooks substituted the available equivalent, shrimp, but kept both names, ostensibly to indicate that the dish was made from shrimp, not langoustine. This recipe was adapted from Taste Of Home.